A breastfeeding mom traveling for work this month without her four-month-old baby has created headlines by drafting an open letter to Delta Airlines after the ticketing agents at Newark International Airport refused to let her travel with dry ice for her pumped (and frozen) breastmilk. Nursing mom Vanessa Urango of Houston, Texas was spending 18 days away from her family and during that time she had pumped more than two weeks’ worth of breastmilk for her younger daughter. 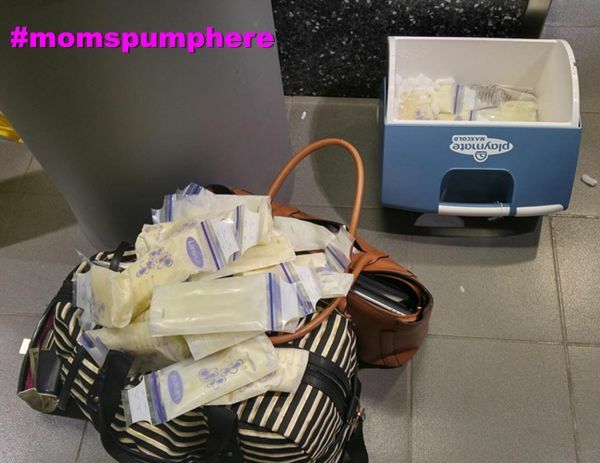 Prior to heading to the airport, she contacted Delta’s customer support (which we at MomsPumpHere suggest moms do when they travel with breastmilk) and she was instructed to pack the milk in a cooler with dry ice and bring it to baggage claim when she checked in. Urango followed these instructions (which required her to spend $85 on a trip to Target to purchase a cooler to fit the dry ice), but when she arrived at the ticket counter for Delta in Newark International airport, things did not go smoothly. In a letter she posted to her personal Facebook page, Urango shares that the Delta employees at the ticket counter were not familiar with the protocol that Delta’s customer support team had explained. “To say they were rude and completely lacking empathy is an understatement,” Urango shared in her letter. We at Moms Pump Here agree with Urango that the airlines and travel companies have a long way to go. I personally have been in Urango’s shoes several times before and the nervous worry of a nursing mom who is carrying weeks’ worth of her infant’s nutrition is difficult to describe. I remember sweating and almost panicking when I was going through both the ticketing line and the security line. I worried that the employees would not be informed of their own company’s policy or of the TSA rules for traveling with breastmilk. We recommend moms travel with a hard copy of the TSA travel policy for handling breastmilk so that we can educate and enlighten such employees who are not up-to-date on the approved protocol.